The more it is researched, Chinese Export Silver is shown to be by far the most complex and diverse silver category. It is virtually impossible to pick up an item of this silver without it being far more than what its outward appearance conveys. Picking up a piece of Chinese Export Silver is tantamount to holding a hand grenade that is so packed with a diversity of history, culture and artistic merit that it is ready to explode and reveal its secrets. While the name it has been saddled with is more a misnomer than anything approaching an appropriate title, it is one that has stuck for the past 50 years or so, for Chinese Export Silver was not necessarily made for what it now says on the can. 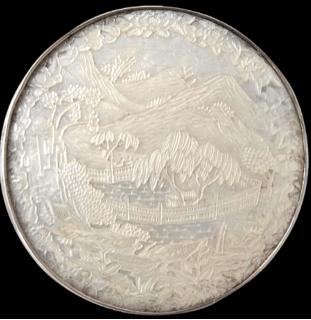 Despite a period of 60 years at the end of the 18th century up until around 1840 when a significant amount of neo-classical silver was made ostensibly for the “export market”, much of the silver prior to that and afterwards was made for consumption in China either by Western residents or the rising Chinese middle class. It is only recently the amount of collated research has revealed some of the identities of what had been considered by the West as the ‘makers’ – most were not makers, they were retail silversmiths or merchant traders of which silver was just one of the specialist commodities. But identifying the person behind the silver mark can often take one on an unexpected journey through time and place. One such a silver mark is Chong Woo of Hong Kong. Silver bearing the Chong Woo mark has always been quite scarce, yet more often than not associated with quality pieces, but it is a silver mark with no particular definitive style. It is a mark that dates back to the early days of the British colony – 1849 to be exact, and it clearly shows there was someone who understood quality of workmanship and style firmly in control. As with most Chinese retail silversmith’s marks, the name is totally fictitious. The real person behind the mark was one Chiu Yu Tin, one of the earliest Chinese settlers on the island, arriving there at the tender age of 14 to seek his fortune. He came from a poor family in Nanhai, not far from Canton. Interestingly, a significant number of the Canton retail silversmiths hailed from Foshan in Nanhai district. 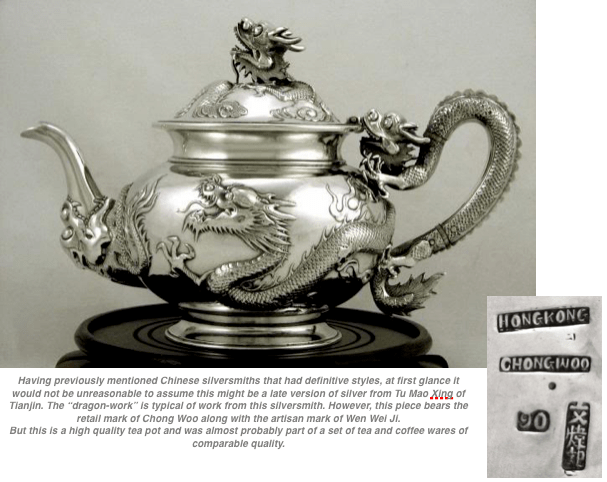 Chiu Yu Tin may well have had some family connection with silversmithing. What we do know, however, is that by 1849, Chiu Yu Tin had made sufficient money to be able to open his first luxury goods business and by 1853 he appears in the Hong Kong Directory as a purveyor of “Chinese Fancy Goods”. 1849 is also an auspicious date in American history since it is the year gold was first discovered by James Marshall at Sutter’s Sawmill in what is today Sacramento, not far from San Francisco. We also know that very soon after opening the Hong Kong operation, beginning in 1851, the San Fransisco Custom House logged entries coming into the USA from Hong Kong from the “Chinaman Chungwoo’ of merchandise comprising teas, silks and other assorted items to the value of $426 being shipped to three separate Chinese merchants in San Francisco. Later shipments were to also include lacquerware, silver wares, furniture, shawls, bed-covers and even women’s shoes. In 1842 when Hong Kong became a British colony, the population of San Francisco was some 200 souls. By 1845 Hong Kong had a population of 25,000; one year after the gold strike in 1850, San Francisco had an identical size population. 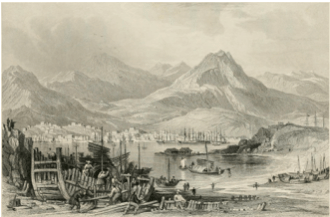 Hong Kong and San Francisco also had an uncanny visual similarity as these drawing of the two naissant cities in the late 1840’s show – Hong Kong harbour [above left] and San Francisco harbour [right]. The value of Chung Woo shipments rose dramatically during the 1850s and particularly so when opium was added to regular incoming shipments to the United States. Chiu Yu Tin may have been young, but what he was engaging in was a typically Chinese business strategy of the time. He created a network of liànhǎo – a chain of traders who were trusted and who usually had either a family connection or came from the same birth town or region. Such trading chains had a complicated ownership structure not dissimilar in many ways to a form of cooperative or mutual society, each individual keeping their own accounts with the host or main shareholder earning a premium – in this case, Chiu Yu Tin. Although it is unclear whether Chiu’s first San Francisco operation was solely owned by him or whether he had a managing shareholding since from records it is clear that the names Chong Woo and what appears to be a sister company, Wing Wo Sang, interconnect. We do know, however, that a trading network developed under Chiu Yu Tin’s ownership that extended to Chile, Peru, Panama and much of South East Asia through his Nam Pak Hong company that traded as Kwong Mou Tai Hang. His Chinese empire stretched to include Shanghai, Shantou, Jiazhou, Dalian and Yingkou. Chong Woo was but one of many such entrepreneurial Chinese Hong Kong merchants who were quick to realise the potential of the burgeoning market half way around the world in California that in so many ways was a mirror image of what was happening in Hong Kong. The only difference was that Hong Kong lacked gold but the growth of affluence that occurred in both locations demanded high quality goods. In a matter of 40 years, Chiu Yu Tin managed to build an international trading empire that, as with himself, began from a humble background. 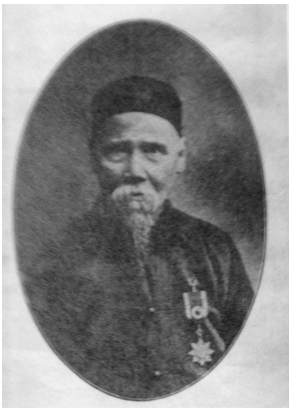 Other Nam Pak Hong [literally: South-North Trading Association] merchants formed a guild in 1868 and in 1873, Chiu was nominated and elected as Chairman [shou zhongli] to the Gold Mountain Traders’ Guild. The image of Chiu above shows him wearing his medal of office, the first to hold it. There were many similarities between the old compradors that were required to keep the engines of Hong Kong’s fast-growing companies well oiled and running smoothly and the Nam Pak Hong. In Hong Kong, several are better known today for their silver marks and the wares that bore them. Wing Fat is one such, Wo Loong another and even the Gok brothers’ Wing On department store on Des Voeux Road operated its own allied Nam Pak Hong. The further diversification of these international/intra-Asian merchant companies took them into the world of insurance and often into shipping. A simple item of Chinese silver ware can therefore bear a mark that can easily take one on a convoluted journey half way around the world and into trading areas that have nothing to do with silver-making. 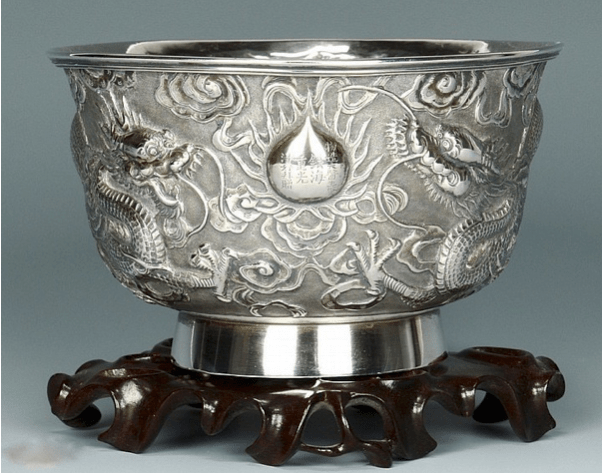 This is just one of the ways that makes Chinese Export Silver so unique – it is so often a vehicle to delve into a much richer history. What is particular relevant is the fact it was these early entrepreneurial merchants who formed the basis of the Chinese bourgeoisie and gentry in Hong Kong and San Francisco – two parallel worlds and a very new phenomenon in the Chinese social order. In Hong Kong, however, the formation of businesses that were allied to the Nam Pak Hong principles became the very bedrock of welfare benefits for those connected with the industry as a whole. Promoting trade on a cooperative basis, assisting the military police, forward planning to deal with emergency situations and maintaining public order were all part of the group agenda of these businessmen. It was Chiu Yu Tin who pioneered this sense of community among this breed of successful Chinese businessmen. The influence of the Nam Pak Hong was to be found somewhere in virtually every public service area. 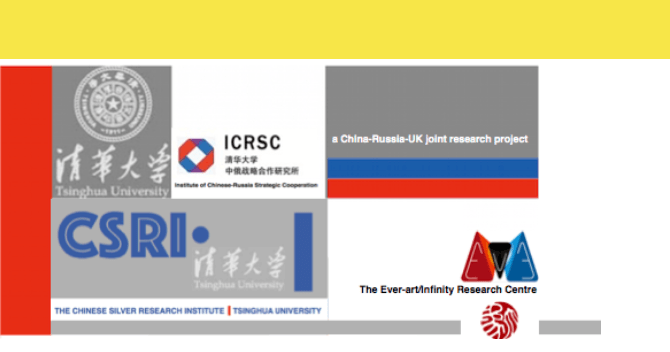 This is quite remarkable, especially when this is taken within the context of the Chinese openly wishing to work hand-in-hand with the British governance of the colony. It is said that Chiu Yu Tin was particularly generous to friends and family and that he personally helped some 1000 individuals to create businesses outside of China. Until the advent of the Great Depression in the United States in the 1930s, the San Francisco-Hong Kong corridor had become very much a “Maritime Silk Route” all of its own. 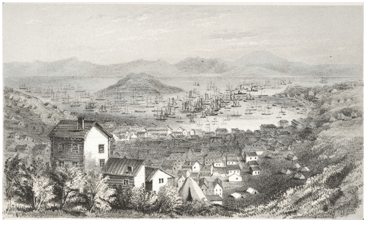 While Hong Kong was by no means the first Chinese diaspora community outside of China proper, San Francisco was the first significant Chinese settlement in the United States. The dualism of two cities rising together, albeit for different reasons, yet on the back of a single commodity, again different in each case, in tandem with the very powerful link that Chinese families and fellow countrymen have by nature was the cause of their success. It is not just the driving commodity, however, that creates success. Both Hong Kong and San Francisco provided Chinese entrepreneurs with a fertile ground in which they could excel without the constraints they would have had only 20 years previously in Canton under Imperial rule. Whereas the majority of Chinese who formed the diasporic communities as we might understand them today went of their own choice, tens of thousands formed the much-overlooked indentured workers that were shipped en masse mainly to replace the void filled by the emancipation of enslaved Africans in the Americas and the Caribbean. Unlike the slaves they were replacing, they did have contracts with the British or American governments; in many cases the reality of their lives and treatment was almost the same as those they were replacing. In 1866, there were no fewer than 10,000 Chinese indentured workers in British Guiana alone. However, in the early 19th century some 618 indentured Chinese workers were sent to St Helena to work on the island’s viniculture. St Helena at that time was under the governance of the East India Company; quasi British rule. Indentured labour was a solution the British devised after the abolition of slavery and in the case of St Helena Chinese young men could pay for their passage by working for a contracted period for the East India Company and were then free to work for whom they wished. Since the East India Company was initially running St Helena, there is ample documentation to show there were a significant number of artisans of various skills. These Chinese were perhaps the luckiest of all the tens of thousands of fellow countrymen who were forced through circumstances to choose the indentured route. While it is doubtful the East India Company would have had the need for a silversmith to be on the island, there could well have been skilled metalworkers as well as someone who was experience in, say, ivory carving. tourist trade. It became fashionable for English Georgian women to visit the island to try to secure an audience with the former emperor. These visits are well documented as happening and Napoleon apparently revelled in them. What is interesting about the semi-indigenous Chinese workers on the island is that around the time of the California gold rush a significant number of them managed to end their contracts by officially securing their freedom under the terms of their indenture. 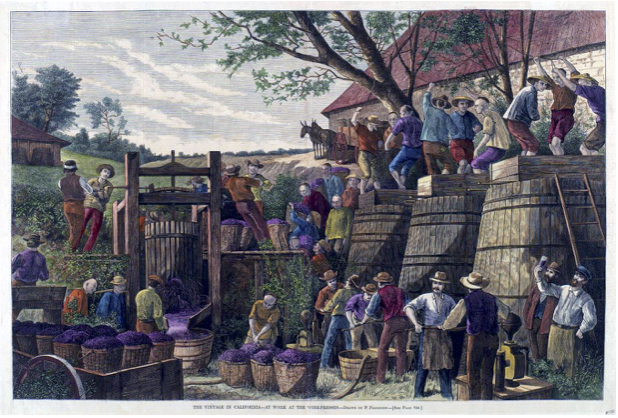 They then made their way to California and while some may well have been successful prospectors, the vast majority formed the core workforce behind the establishment of the Napa Valley viniculture industry. 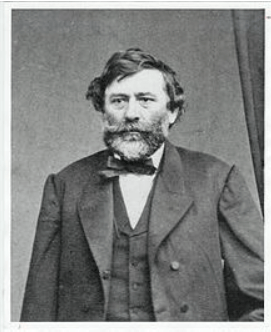 It was the acknowledged “father of Californian Viticulture”, Colonel Agoston Haraszthy – a Hungarian immigrant, who is generally held to be responsible for introducing the Chinese into the vineyards of the Napa and Sonoma Valleys. The vineyards were not the only agriculture that attracted the Chinese. By 1880, across California from the San Francisco Bay Area to the Sierra Nevada Foothills there were some twenty Chinese fruit growers apart from numerous Chinese tenant farmers. Hong Kong, as with its California sister city San Francisco, was formed on a bedrock of a highly complex and interwoven social structure. Each was inter-dependent on the other and each city was founded on an economy that promulgated and, to a large extent, depended on the trade in luxury goods [in some ways one has to regard opium as a luxury trade – it was expensive and it was not vital for everyday life]. In both cities history tells of the same trail of how affluence brought the successful in face-to-face contact with those that were not. This in turn spawned a completely self-motivated desire to create a social infrastructure that brought welfare to the less fortunate and a reasonable level of safety and sense of security to those responsible for creating the infrastructure. Chong Woo is but one of many Chinese names that appear on Chinese silver marks that was run and owned by an entrepreneurial Chinese merchant. These are the names that for so long were mistakenly considered to be “makers”. A significant number of these merchants became involved at some stage in the opium trade. One of the few that did not was the owner of Wang Hing & Company, the Lo Family, who for almost 95 years made a point of having no connection whatsoever with the opium trade. What other world silver category item picked up at random could have the capacity to take one on such a journey just by looking at the silver mark? One should also possibly think of the Chinese next time one drinks a glass of Californian Pinot Grigio!